Can it already be the end of February? Just a few more days and we’ve entered the month of March and, soon, the beginning of spring. And after the misery of a few cold rain showers, it will be summer – the giddy, glorious season of the sun. I’ve lived in a lot of places and visited a whole lot more, and I don’t think there is a better city in the summer sun than Chicago. Just station yourself somewhere around Diversey Harbor on a sunny day, with the highbrow high-rises of the Gold Coast edging along the green expanse of Lincoln Park on the other, and the great towers of downtown in the distance. You’ll see what I mean. We set all that aside for the seasonal factoring of this waning set of dark months. The sand berms, plowed up before the season began, guard the beaches and snow fences, soon to be picked up, line the length of the lakefront. The gardens south of the Lincoln Park conservatory, lovely and lush this summer, lie stripped bare. But there is still some light at 6:00, and a new season is about to begin. We must be close . . . 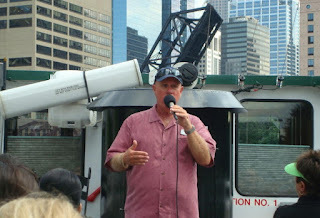 I just signed up for my first river tours of the season as a docent of the Chicago Architecture Foundation. It doesn’t seem like two months since the last bridge-raising of the year took place. I was lucky enough to be giving an architectural tour of the Chicago River when the Columbus Drive Bridge opened shortly before 9:00. It’s always a magnificent sight . . . these massive bridges raising sequentially, stopping traffic on a Saturday morning, while the last few one per centers sail their yachts up the river. In a couple months they will all be raising once again, and the boaters will be heading out toward the lake and a whole new season of warmth and possibility. But now the harbors are empty and, like the boaters, we have had just about enough of hoisting the summer part of ourselves into the dark of winter storage. I always miss the summer. It doesn’t matter how soft a cashmere scarf is, it’s still no substitute for sandals and shorts. For me it was a great summer. Jill and I became grandparents for the first time and little Maddie Jane, she of the ready smile and sunny disposition, has made us a couple of decades younger. Picco the Pooch came to stay with our other daughter down in Champaign, and the little guy made us remember how great it is to take a dog for a walk when the weather’s fine and you’ve got the time. I spent much of the time on the deck of an architectural tour boat. It didn’t seem like it at the time, and it doesn’t seem like it now, but I gave 120 tours of the Chicago River since the beginning of the season last May. Volunteering for the river tour is a dream job for an old retired teacher. You can’t beat the experience. I’ve stood up there with a microphone in my hand in every sort of weather. Pouring rain, slashing down so hard I couldn’t even see the buildings on Erie Park from the river, the only time all summer where not a single sole was up on deck with me. One dark Wednesday I stood in a cold rain with the wind blowing so hard that city officials closed the lakefront bike path for fear that the 25-foot waves would wash someone into the drink. I got stung between my forefinger and middle finger by an angry wasp one sunny afternoon as I was pointing to the top of 360 North Michigan. Had a full cup of iced coffee land at my feet after someone waving to our boat from the Adams Street Bridge lost his grip on the Starbuck’s cup. But there were far more glorious Chicago moments than bad. I gave a tour to the President of Croatia and a couple months later to Rosie O’Donnell. A group of five bridesmaids, all in yellow, along with their attending groomsmen and the bride and groom captivated everyone on the boat one Saturday morning as they greeted us from the Kinzie Street Bridge. And on a beautiful October afternoon to little Maddie Jane and her mom. Maddie slept the whole 90 minutes. Mostly, though, I remember the sun and the beauty, always brand new, of this spectacular city, wrapped ‘round by a gentle river and capricious lake. It’s a great city, a complex city, caught between the extremes of nurturer and destroyer, of beauty and terror. A city that rises from the flatness of the Midwestern prairie, throwing up shimmering spires next to a lake that laps at the grasslands. It’s a great city, a world-class city, and I can’t wait for summer to show it off.